Capt. 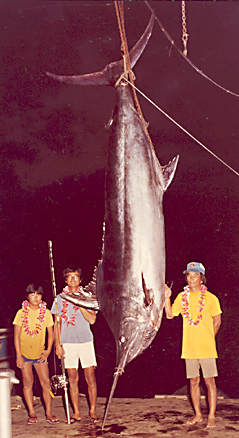 Ray Kawahara and Walter Koyanagi were competing in the Kona Mauka Trollers Club Fishing Tournament on the LAHELA when they hooked their behemoth. The fish was caught after a 21/2-hour fight on 180-lb test line spooled on a Penn Senator 14/0 reel. It was the largest marlin caught during a Hawaii tournament up to this time.